In this post we are going to learn new simple but very useful topic like how to make dynamic star rating system by using PHP Script with Ajax JQuery. By using this simple code you can easily developed Star rating system for in your web application. Here we will make Jquery Ajax rating system by using PHP script with Mysql. We will use very light code for developed dynamic star rating system. Now a days if we have search for any company on Google, then in search we can see particular company details with rating display with search result. That rating defines the popularity of that company or product in market. If rating high that means is provides good services or in product rating, that product quality is good than other one. So from rating we can decide which one is good or bad. Even in movies we can see rating given by audience. If rating is low that means movies is not google and if rating high that means movies is good. So from rating we can get idea regarding any product, company, restaurant or even movie good or bad. We have to try or not. So this type of system we are going to developed here by using PHP script with Ajax JQuery. Here we have two table like business and rating. In business that we have already insert some business data and rating details will be inserted into rating table. First we have load all business data on web page with star rating by using Ajax. After this we want to change color of star on mouse move and after mouse leave we want to reset particular business rating. So this things we have done by using Jquery code. And lastly we want to assign rating to particular business. 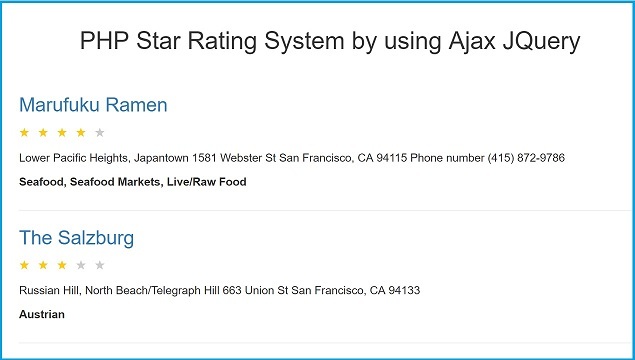 So we have use Jquery click event, so when user give rating to particular business and he will click on particular number star then at that time we have use ajax request and it will send data to server and it will insert rating data into rating table. Based on available rating data, we have use average of all rating for display rating of particular business on web page. This way PHP Star rating by using Ajax Jquery has work. Below this you can find source code this tutorial with online demo also.